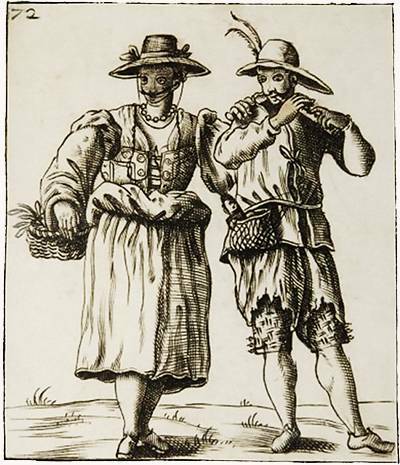 The "villottes" represent, in Friuli (that was one of the poorest and less considered areas of Veneto during the XVI century) kind of peasant songs, popular, folkloric ballads similar to the "stornelli" so popular in Tuscany. Melodies to which (thanks to the simple structure) all texts can be adapted. So here we have two peasants masks, created to be ironical over the way peasants dress (and to make fun of furlans? I would say).